Stepping Stones works with schools to provide alternative autism education for elementary, middle and high school students on the autistic spectrum who are not succeeding in a traditional school settings. Stepping Stones serves students who have been removed from school because of extreme or violent behaviors and they are thriving in this year-round program. 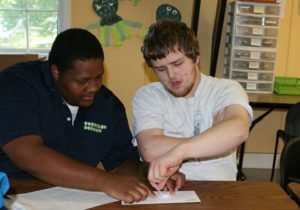 The Step-Up program enables students to increase communication, social skills, functional academics and functional living skills – while developing acceptable behaviors to fully participate with their family and in the community. The Step-Up program is designed to enable students to increase communication, social skills, functional academic and functional living skills – while developing behaviors to fully participate in family interaction and their community. The goal of the Step-Up program is to provide each student with the tools to transition back to their local district. The Step-Up program is located on the Stepping Stones Given Campus, a serene, park-like setting with hiking trails. Classes are conducted in a home-like setting in three small buildings with individual rooms, or individual workspaces, bathrooms, kitchens and common areas. Highly trained staff provide a learning environment designed to create a positive learning experience. Each classroom is led by a licensed teacher. Each student is paired with a 1:1 Educational Aide to support him/her throughout the school day. School-age children diagnosed with a disorder on the autism spectrum and who are experiencing difficultly succeeding in a typical school setting. Interested in the Step-Up Autism Alternative Education Program? Contact the child’s school principal to discuss Step-Up as an alternate placement. The school can arrange a tour of Step-Up for parents of children who are eligible. For more information on the Step-Up Autism Alternative Education program, please contact us online or call the Educational Services Manager at (513) 965-5118.